Department of History. American Civilization students participate in the lively intellectual life of the campus and the Department of History, including the weekly History Workshop series organized by the department and other lectures and colloquia. The Department’s growing interest in comparative approaches, and its established strengths in the social history of technology, the Atlantic World, and the history of the United States’ development as the world’s premiere consumer society offer strong frameworks for the study of material culture. The Emerging Scholars Symposium and DELPHI. 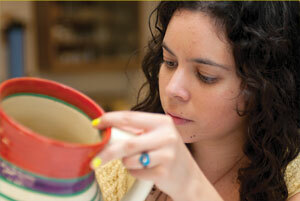 American Civilization students are leaders among graduate students interested in material culture studies on campus. They originated the annual Emerging Scholars Symposium, funded through the Center for Material Culture Studies (CMCS). Each year, Am Civ students work with peers from other departments in organizing this program, which showcases original research in material culture by graduate students from around the United States. Emerging Scholars gives students experience in organizing an academic conference. It is also great way to meet peers and future colleagues as you begin your preparation for a career as a scholar of material culture. CMCS also offers many opportunities for students to present their own work and learn about the work of other scholars on campus. It sponsors a summer program for graduate students, the Delaware Public Humanities Institute (DELPHI), that offers a generous summer stipend as well as a two-week course in public humanities scholarship. Museum Studies Program at the University of Delaware. Since 1972, the University of Delaware’s Museum Studies Program has introduced students to successful careers in museums, historic sites, and cultural agencies and organizations. The 12-credit program is open to any University of Delaware graduate students (including Am Civ students) enrolled in a degree-granting program. Students take a minimum of 9 credit hours of classes and complete a three-credit internship to receive the Certificate in Museum Studies. Instructors include distinguished professionals from area museums as well as university faculty. The Museum Studies Program also offers opportunities for graduate students to work as graduate assistants. Winterthur Museum, Gardens, and Library. Our program enjoys a strong relationship with Winterthur Museum, Gardens, and Library. Students planning to enter the American Civilization Program come to Delaware early to participate in the museum’s Summer Institute, a one-month course that is required for all incoming students in the Winterthur Program in American Material Culture, a two-year program leading to a Master of Arts degree. The Summer Institute is an opportunity to learn about Winterthur’s museum and library collections, and to receive an introduction to American craftsmanship and design up to 1850 through hands-on experience with objects. Our students have been very successful in their applications for slots in the Winterthur Program’s annual English Design Course, which takes place in January. Many of our students have also received research fellowships from Winterthur, which they use to advance their dissertation research. While Winterthur’s artifact collections focus on American decorative arts made and used in the United States before 1850, the superb library collections of trade literature, ephemera, imprints, and manuscripts carry the story of American material life up to the mid-twentieth century. Students enrolled in the History of American Civilization program are granted a library card and library privileges at Winterthur’s Collection of Printed Books and Periodicals. Material and Visual Culture Exchange Program with Queen Mary University of London. In 2018, with generous funding assistance from the Center for Material Culture Studies, the History of American Civilization program embarks on an exciting new program of international scholarly exchange with Queen Mary University of London (QMUL). This exchange program will take place in London in January (in tandem with the University of Delaware’s British Design History course) and then in September in Delaware. The exchange program offers participants an opportunity to present their work at a graduate colloquium, take part in workshops on methodologies in visual and material culture with leading scholars and curators in the field, and hear from two keynote speakers, one from each institution. The program includes site visits to key museums and art galleries in both areas, including the Victoria & Albert Museum in London and the Winterthur Museum in Delaware. We also expect participants to have an opportunity to publish their work in a special issue of the leading US journal in material culture research: The Winterthur Portfolio within five years of this inaugural exchange. Hagley Museum and Library. The mission of the Hagley Museum and Library is to collect and interpret materials relating to the history of American enterprise. An important focus of the collections is industrial design, and the collections of trade catalogs and other imprints dovetail with the collections atWinterthur, supporting research on the development of American consumer society up to the present day.